Last night the sensational Belgian bluegrass film drama, The Broken Circle Breakdown, had its first screening in Ireland, at the Sligo Film Society in Sligo town in the north-west of the country. The Broken Circle Breakdown has been breaking cinema attendance records and boosting opportunities for bluegrass bands on the Continent since its release in 2012. Between now and the beginning of May 2014, it will be shown at many film clubs and local art centres throughout Ireland, including at least one in Northern Ireland. The schedule, as shown at present on the Access Cinema website, is reproduced on the Bluegrass Ireland Blog. The Award ceremony will take place during the late concert of the Lonesome River Band on Saturday 15th March 2014, 20:30hrs, as part of the 6th European Bluegrass Summit. Both summit and concert take place at the Hotel OREA Pyramida in Prague. In 2012 the EBMA Board set up the European Bluegrass Pioneers and Personalities Project (EBPP) to recognise and acknowledge the past and present most influential European musicians, promoters, journalists, DJs, luthiers, experts, and others who contributed, and still contribute, in a relevant and significant way to establish or popularise the bluegrass music genre in Europe, and to create a European bluegrass scene and community. Personalities: To have promoted or contributed to promote special projects or have reached special achievements during the last year. Members of the selection committee and serving members of the EBMA board are ineligible for nomination. To register for the 6th European Bluegrass Summit and/or the concert, please go to http://www.ebma.org/ebs or contact bluegrass.summit@ebma.org. The sad news is in all the papers all over the world, in all languages. This really is the end of an era. GRAMMY's 2014: Musician Pete Seeger was listed as a candidate for Best Spoken song for his album, "The Storm King," an audio book of stories, narratives and poems put to music. Woody Guthry Prize: Pete Seeger was going to accept the "inaugural Woody Guthrie Prize" on Sat., Feb. 22, 2014. A prize that is to be given annually to the artist who best exemplifies the spirit and life's work of Woody Guthrie by speaking for the less fortunate through music, film, literature, dance or other art forms and serving as a positive force for social change in America. Pete Seeger would have been the first receipient ever. http://woodyguthriecenter.org/blog/2014/01/09/woody-guthrie-prize/. The photo shows (l-r) Pete, Toby, Ruby, Josh, and Geary. To request a CD, call Pete on +44 1843 822085. Contact the band by e-mail. The Bluegrass Ireland Blog reports that PineCone, the Piedmont Council of Traditional Music, is among the non-profit organisations of North Carolina who are in the running to receive a 'technology makeover'. The two organisations with the highest number of votes will receive new office and network equipment worth a combined value of $35,000 from Milner, Inc. In addition to PineCone's work in supporting traditional music in North Carolina, it has given invaluable help over the years to the Appalachian and Bluegrass Music Festival at the Ulster American Folk Park at Omagh, Co. Tyrone, Northern Ireland, by enabling many fine US musicians to perform there. Most of PineCone's budget goes straight to its programmes, paying artists, sound engineers, facilities, marketing, and related costs. Anyone, anywhere in the world, who approves of PineCone's work can help (at no cost to themselves) by voting for it - and this can be done once a day, every day from now up to and including Sunday 26 Jan. We can also help by spreading the word, and by Liking and sharing the voting site on Facebook, Twitter, and favourite social media sites. Panel sessions aimed at providing practical insights and useful advice will replace the round-table workshops at this year's summit, with more fun and extra-curricula activities planned throughout the weekend to keep participants active and involved. Lonesome River Band to headline concert on Saturday evening. The 6th European Bluegrass Summit will once more take place in the beautiful city of Prague, hosted by Rosta Capek and Ivana Louková, two very experienced promoters and organisers. As a highlight, Ivana and Rosta have arranged for a concert with the one and only Lonesome River Band to be presented on the Saturday of our summit, which will frame the presentation of the second set of EBMA pioneers and personality awards. The concert is about to be sold out shortly. EBMA has a limited number of tickets to the concert available for summit participants, so an early registration for the summit is highly recommended! As in previous years, attendees are invited from all European regions and beyond, the costs and arrangements for travel, subsistence and accommodation are the entire responsibility of the participants. A number of rooms have been reserved in the OREA Hotel Pyramida****, Belohorska 24, Prague 6. Therefore early booking is advised. The board of EBMA feels that the round table discussions that formed the core of previous summits have served their purpose well in getting the summit positioned as a building block of the European Bluegrass scene and that we should now move towards more practical sessions along the lines of IBMA’s World of Bluegrass. Each panel session will offer participants an opportunity to ask questions and interact with a panel of experts on the subject for one hour. Panel sessions will not be on at the same time so participants may attend all of them if they wish or, if they prefer, they may take part in some of the extra-curricula activities that will be running throughout the weekend. Check out invitation and programme. Czech in! – once more! Thanks to Oliver Waitze of the New Acoustic Gallery (NAG) in Wuppertal, Germany, for the January 2014 issue of its newsletter. The NAG stocks the finest acoustic instruments and accessories for bluegrass, gypsy music, and other genres, offers a repair service, and organises workshops and concerts. Some of the outstanding instruments that have recently come into stock include a used Recording King RK R80 5-string banjo and a Stanford Big Bang baritone guitar. More information is on the NAG website. The New Acoustic Gallery's workshop programme for 2014 includes a one-day mandolin workshop with Mike Marshall (above) on Saturday 26 April - a day of intensive mandolin instruction with this master mandolin virtuoso, concentrating on tone production, clear articulation of notes, left-hand work, chord-finding, and rhythmic patterns in various musical genres, with opportunities for playing in a 'one on one' master-class setting. Booking (€150) and information: +49 0202/94672730. 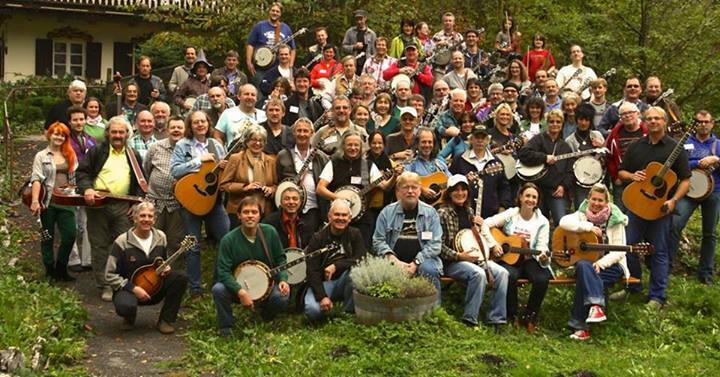 * the bluegrass / flat-picking workshop at Bluegrass Camp Munich in Aschau / Chiemgau, 10-13 Oct. 2014. Thanks to C. Paul 'Dobroman' Lyttle of Moniaive in south-west Scotland for the news that the next Moniaive Michaelmas Bluegrass Festival will be held on 26, 27, and 28 September 2014, with the full lineup consisting of two American, two Scottish, and two English bands. The four-piece band of Carpenter & May (USA) will headline Saturday night; and the Whitetop Mountain Band (USA), whose latest CD cover is shown on the right, will headline Friday night. Also on the bill are the Dirty Beggars (Scotland), the Mairs Family Band (Scotland), Dalebilly (England), and the Jaywalkers (England). Tickets will be on sale from April onwards. More details are on the Festival website. Paul also presents the fortnightly 'Criffel Creek' record show on Alive Community Radio from Dumfries, Scotland - see the EBB's separate 'Radio playlists' post. The 4th annual 'Bluegrass Im Klosterhof' mini-festival, held on the second Saturday in January, again turned out a great success. No posters were hung, no flyers were distributed, the festival wasn't even advertised online - and still, all 200 tickets were gone two weeks after sales started on 1 December. From 7.00 p.m. through 12.30 a.m., seven acts and the indispensable finale jam populated the stage in the historic seventeenth-century building in southwest Germany. The organisers held a poll asking attendees, among other things, if they thought five-and-a-half hours of acoustic music were a bit too much - and only 12% thought so (I guess most of them had standing tickets only - unfortunately we can't seat all of the 200 which is the maximum legal occupancy). So, next year it's going to be another long night - mark your calendars: 10 January 2015, 7.00 p.m. through whatever wee hour. This year's line-up included Horse Mountain (local heroes and organisers of the whole event), Nashville Blue, Mr. Big Band, Four Potatoes, Songbird, and George Baehr & Baehrtracks. Also, Rudie Blazer had compiled a temporary project band with Rainer Zellner, Norbert Dengler, and Bernd Müller. Many thanks to all the talented artists and, most of all, to our loyal (and largely local!) audience base, see you next year! 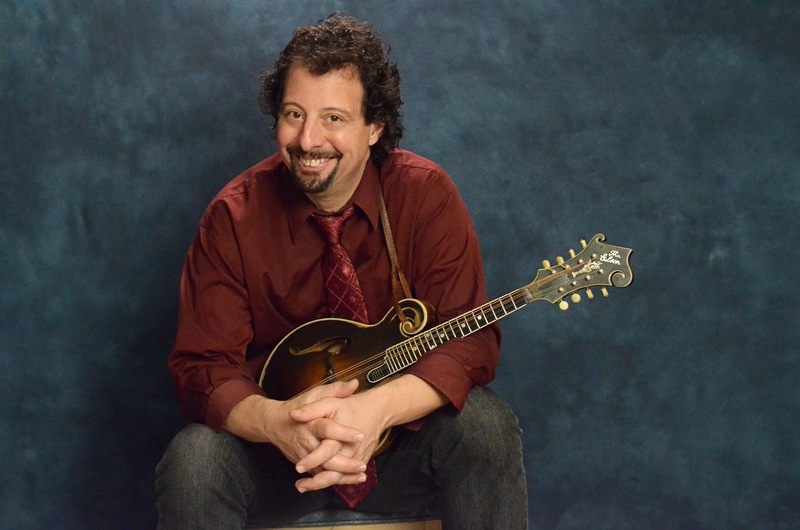 Thanks to IBMA's Convention & Membership Services Director Joe Lurgio for this link! Please share this great music with your friends and family by sharing the link. Don't forget we now accepting online applications for the 2014 World of Bluegrass showcases at http://ibma.populr.me/bluegrassramble through an easy process. We can still take submissions by snail mail if necessary. Please call the IBMA office for more information on submitting hard copy applications. Congratulations! Bulgaria's Lilly Drumeva has successfully completed her Fulbright research time in the US. She has recorded more than 50 interviews with bluegrass and country music professionals. Some of her articles are available at www.lillydrumeva.net in the section "Lilly's Publications". Lilly of the West will have a special concert on St. Valentine's Day (14. 02.2014) at Studio 5 club in Sofia. The band will present their new single and video "Valentine Moon". The show may feature also Yiannis Gougourelas, top acoustic guitar player from Greece. The next Bluegrass Jam Camp taught by Petr Brandejs using the Wernick Method is scheduled for January 24-26, 2014, in Slovakia. Find more info here. The weekend Jam Camp took place on November 1-3 at a cottage Svinec just above the town of Nový Jičín, where I live. Joined by my wife Iva (playing bass) I was lucky to get two fine assistants - my brother Pavel (my boss in the band Bluegrass Cwrkot) and my banjo student Petr Maslo, now a marvelous banjo player and singer. With the help of these two nice gentlemen I led the Camp with 17 students starting Friday night until Sunday afternoon. Though jamming all day, students were eager to play until well after midnight and did enjoy the relaxed atmosphere and environment as much the instructors did. Thanks to Bluegrass Today for the news that three members of the vigorous and innovative Barcelona bluegrass scene have formed a new group and expect to release their debut CD in February 2014. Grazztrio - Lluís Gómez (banjo), Oriol Gonzàlez (mandolin), and Maribel Rivero (bass) - have recorded a twelve-track album, Three sheets to the wind, using the bluegrass instruments to embody their wide range of musical influences. A video of them performing the five-and-a-half minute composition 'Funky thumb' can be seen on Bluegrass Today or on YouTube, where Grazztrio have seven other videos on their own YouTube channel. Thanks to Joe Lurgio of IBMA for this information. EBMA would like to encourage all European bands interested in presenting themselves at this year's Bluegrass Ramble to check out the application process and the benefits of showcasing. IBMA's 2014 World Of Bluegrass is scheduled for 30th September - 4th October in Raleigh, North Carolina. We are excited to announce that 2014 World of Bluegrass showcase applications are now being accepted. This year we are using an online option for showcase submissions. The deadline to apply for an official showcase is February 28th, please help spread the word by sharing the link below. Applicants can apply online at http://ibma.populr.me/bluegrassramble. We can still take submissions by snail mail if necessary. Please call the IBMA office for more information on submitting hard copies. If you have any questions, please email me at joe@ibma.org or call the office at 615.256.3222. We are excited about this new and easy process and look forward to another rockin' Bluegrass Ramble! The Friends Of American Old Time Music And Dance (FOAOTMAD) announce in their weekly e-newsletter that e-tickets for the Gainsborough Festival can now be bought through the FOAOTMAD website using Paypal. Pre-booking is advisable; payment can also be made by post, with stamped addressed envelope. The Festival will be held at Queen Elizabeth’s High School, Morton Terrace, Gainsborough, Lincolnshire DN21 2ST, England, on 14-16 February. US artists taking part include the Bucking Mules (Joseph Decosimo and friends – 2012 Clifftop band winners), the Rutro Ramblers (Rich Hartness and friends), Trevor & Travis Stuart, and Matt Gordon (clogger). UK performers include Grey Wolf, Bones Creek, Stompin’ Dave Allen, and Appakella. The e-newsletter also announces a rare opportunity to buy a Cedar Mountain 'Dwight Diller' banjo, pre-2005; shows by touring US musicians in Britain; and news of Kate Lissauer's 'La Fuente de Musica' workshop week in Spain (10-17 May 2014). More details of these and other news items can be found here. The Flatland Mountaineers are Paul van Vlodrop (banjo/vocals), Percy Copley (mandolin/vocals), Paul Rodriguez (guitar/vocals), James Field (guitar/vocals), and Cees Dekker (bass/vocals). A chance to kick off 2014 with some hard-core traditional bluegrass.